When you slip or trip and fall, you feel embarrassed because everyone is looking at you for no good reason, but don't rush to blame yourself for that. Your actions may not be the reason why you fell. If you have fallen due to slipping on a spilled liquid or other substances somewhere other than your home, it is entirely possible that it was someone else's fault and that you may be able to claim damages from the liable person or company. If you have been injured in a slip and fall accident in Fort Myers, Lee County, you may be entitled to recover compensation for the injury you have sustained due to the negligence of others. You should speak with the best Fort Myers slip and fall lawyer you can find to understand the law and the property owner's liability and responsibility. 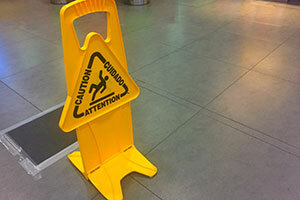 Our Fort Myers slip and fall attorneys at the Wolfson Law Firm can help. We have been serving injury victims in Florida since 1963 and we are here to help you get the justice and compensation that you deserve. Call us at 239-777-9954 for your free consultation. We will examine your case, let you know what your options are, and help you decide whether to pursue a claim for personal injuries and damages. Do You Have a Good Fort Myers Slip and Fall Case? When a client reaches out to us for free consultations, we listen his or her story attentively. We ask necessary questions to clarify all the facts about your accident. We want to know every single detail because that's how a strong case is built. When needed, we will work with your doctor and other experts to prove certain important facts. We will employ investigators and slip and fall experts to assist us in determining if you have a strong slip and fall case in Fort Myers and whether you should pursue money damages. If our investigation of your case shows that you have a good case, we will prepare a settlement package for the defendant and their insurance company. We will demand full, fair and complete compensation for your injuries and damages. We will set a reasonable time to respond, and if they don't, a lawsuit will be filed against them on your behalf. They will try to prolong the case, but we have dealt with the "delay, deny and don't pay" strategy for more than five decades. We know what to do and what it will take to get your case resolved efficiently through settlement, trial or even an appeal when necessary. Never forget - justice delayed is justice denied. If the defendant and the insurance company don't want to settle for a fair compensation, we will file a lawsuit. Before getting a trial date, the court will order a mediation between the parties. Even though our Fort Myers personal injury lawyers desire successful settlement to save you time and energy, they approach these negotiations as if there would be a trial. Defendants and insurance companies would not be serious if we don't show them that we are prepared to face them in court, but when they realize that we are prepared to go to trial to get you the compensation you deserve, they usually come forward with more reasonable proposals to settle your case. If we don't reach a settlement with full and fair compensation, then we will go to trial and when necessary, file an appeal. It is important to note that we always endeavor to provide the best possible legal service to our clients in an aggressive yet professional manner. We never refer cases to other firms, but we accept referred cases from other law firms. At the Wolfson Law Firm, our Fort Myers personal injury lawyers will be by your side from the first call through the final resolution of your case. If you happen to be injured in a slip and fall accident in Fort Myers, whether it is in a convenience store, gas station, supermarket, bank, or any commercial business, call our Fort Myers slip and fall attorneys at the Wolfson Law Firm to help you determine if you are entitled to damages recovery. You can reach us at 239-777-9954 for your free and confidential consultation. You don't pay us fees unless we recover for you.